"This one book is all you need to align yourself with your core financial strengths. It is inspiring, fun, practical, and straightforward." "Cynthia gives a very detailed account of the history of money and exercises which allow us to tap into the energy of money to create a flow of money in our lives today." "This is not your average how to handle your money book. It takes money to the level of energy and lets you interact with it in the creative dimension." can your relationship with money get? Can you imagine feeling happy, enthusiastic, and grateful about your finances? When your relationship with money is optimally aligned, you are better able to discover new sources of money, keep more money that comes your way, and more easily increase your savings. The secret to understanding High Energy Money rests not so much in noticing what it is about this money that is so special, as in activating an energized relationship between money and ourselves. 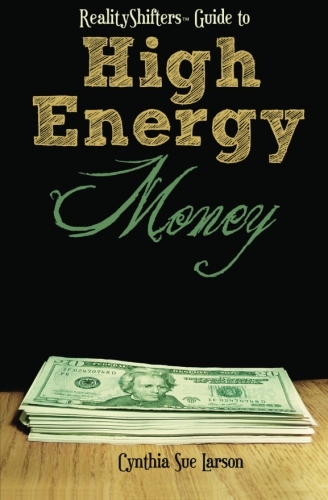 The High Energy Money concept is based on the principle that our thoughts and feelings literally change the physical world. When we are feeling happy in our relationship with money, we can become increasingly confident re-envisioning what money means to us and how to best work with it and enjoy it. When we are feeling in harmony with High Energy Money, we can take responsibility for infusing a sense of infectious optimism into our intentions for money. When our relationship with money is optimally aligned, we can more easily discover new sources of money, keep more of the money that comes our way, and steadily increase our savings... in any economic climate. A better understanding of the energy of money provides us with a deeper sense of respect for the way we interact with it, and the way our thoughts and feelings influence our financial reality. Be inspired by real life stories of High Energy Money and learn practical ways to start experiencing tremendous prosperity and financial good fortune as your thoughts and feelings positively influence your financial reality.